Today I have a rare kid/baby-related post for y’all. One of the ladies I work with is pregnant with her first girl (they have 2 boys already), so we decided to throw her a baby shower. As part of the decorating committee, I was in charge of a centerpiece. So I decided to try my hand at making a diaper cake. 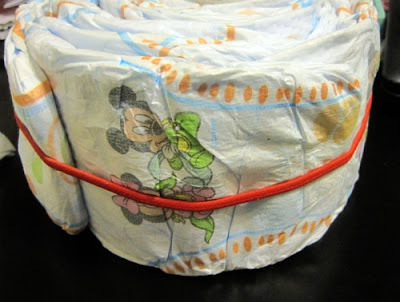 Most of the diaper cakes I found online are made by rolling each diaper and wrapping it in a rubber band. I thought about doing that until I saw this diaper cake. 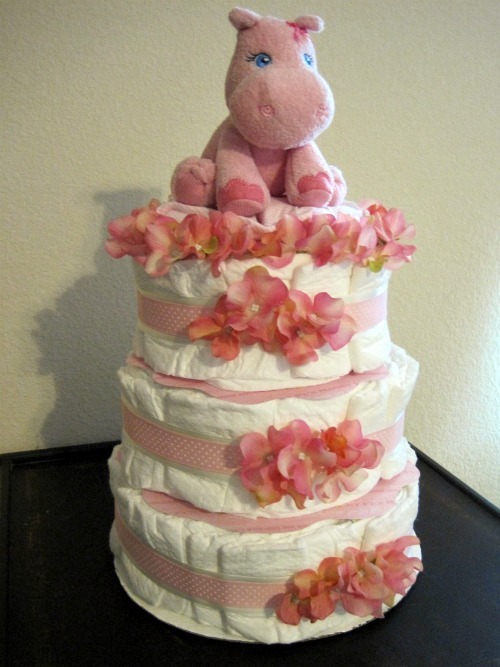 They are so many beautiful diaper cakes out there, but I especially liked that one. Mostly because of something a lady wrote in the comment section. She basically said that she liked this cake because it would be less work for the mom to deconstruct. It makes sense – taking off 80 individual rubber bands would be a pain and I don’t want my gift to be a chore! I’m so happy with how it turned out! And everyone at work loved it! 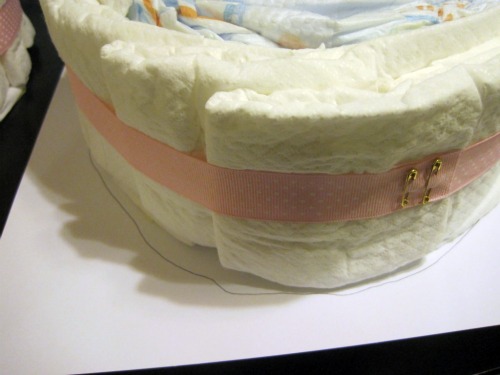 So, how about a diaper cake making tutorial? I started off taking lots of pictures and then completely slacked off…my bad. Just stick with me and let me know if you have any questions. 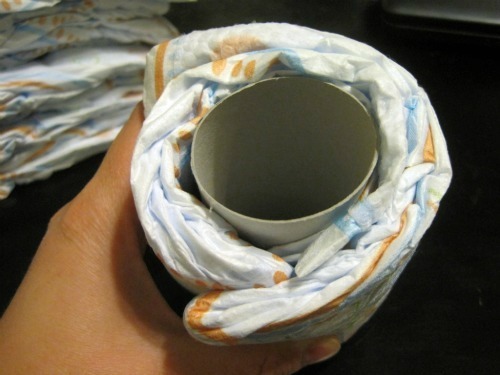 Wrap a diaper around a toilet paper tube (or paper towel/mailing tube cut to size). 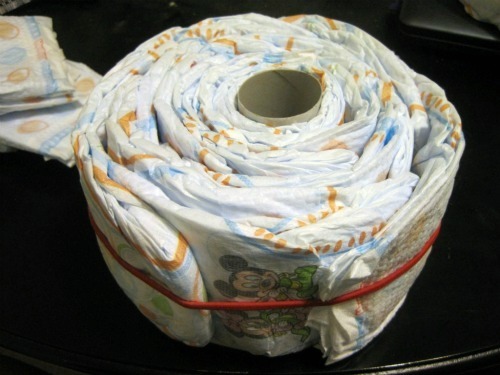 * The first pack of diapers I bought weren’t white (FAIL), so I used those in the middle of the layers and covered them with a second package of white diapers (Pampers Swaddlers). 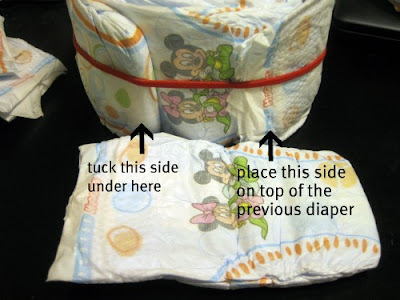 Continue layering and wrapping diapers in any direction. Now the diapers will need to start being layered nicely. I tried to explain how-to in the picture below. Continue layering until it’s the size you want. My bottom layer was about 12” in diameter. Repeat process for next 2 layers…I didn’t use a cardboard tube for the top layer. 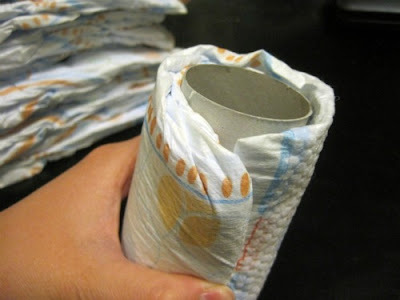 Just roll a diaper and start wrapping around that. Stuff the wrappers from the diapers in the cardboard tubes. I think it’s nice for the mom to know exactly what brand/size diapers are included in the cake. I used 2 bags of diapers, hence the 2 cardboard tubes. 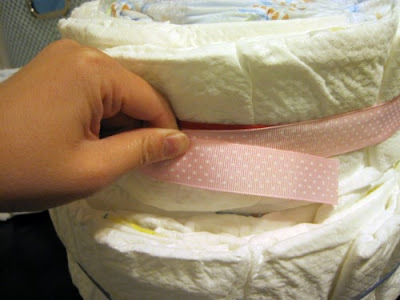 Measure out a piece of ribbon and wrap tightly around the layer. * You’ll notice in the final pictures that I ended up layering a larger ribbon under this one. Definitely go with 2 ribbons…it looks so much nicer. Secure the ribbon with a couple small safety pins or hot glue. Repeat for next 2 layers. Now you can remove the rubber bands/elastic headbands. Find something round that’s about the same size as the bottom layer (I used a mixing bowl) and trace it onto a piece of cardboard. 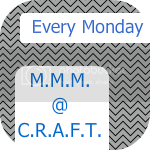 Paint the cardboard – I just used cheap white acrylic craft paint. 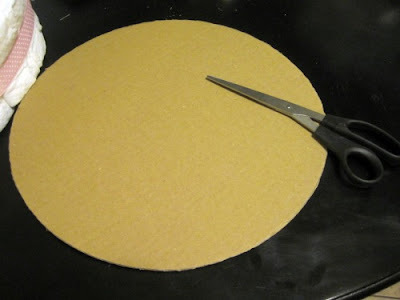 If you don’t have any cardboard, you can buy cardboard cake rounds (usually in the craft aisle). They are already white, so no need to paint them. Loosely trace the bottom 2 cake layers on coordinating scrapbook paper – don’t get pencil marks on the diapers. Cut out the circle in a random-wavy pattern. Hot glue the silk flowers (or you could make paper/fabric flowers) individually onto the ribbon to cover the safety pins. To secure the layers I used a wooden kabob skewer. Just work the skewer from the top down being careful not to stab through a diaper. As you can see in the pictures above, I used blue diapers in the middle section of my layers. The blue diapers in the bottom 2 layers are covered by the scrapbook paper and the next layer, but the top layer is just hanging out there for the world to see. I solved this by adding an onesie to the top. 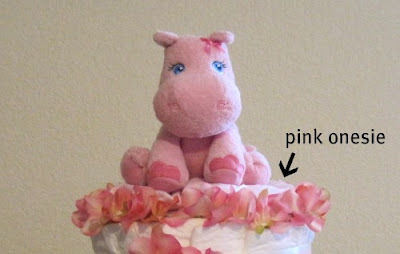 I topped the cake with a cute little stuffed hippo and stuck the left over flowers around the top layer. Just individually cut each flower leaving a little stem and tuck them in the diapers. Don’t hot glue them to the diapers! Oh, later that night I ended up painting a wooden letter ‘A’ (for the baby’s name) and adding scrapbook paper with Mod Podge. Sorry for the cell phone pic – I didn’t think to take a picture until I was on my way to work. This is just what I did to create this specific diaper cake. There are hundreds of other tutorials out there and you can easy put your own spin on any of them (including this one). 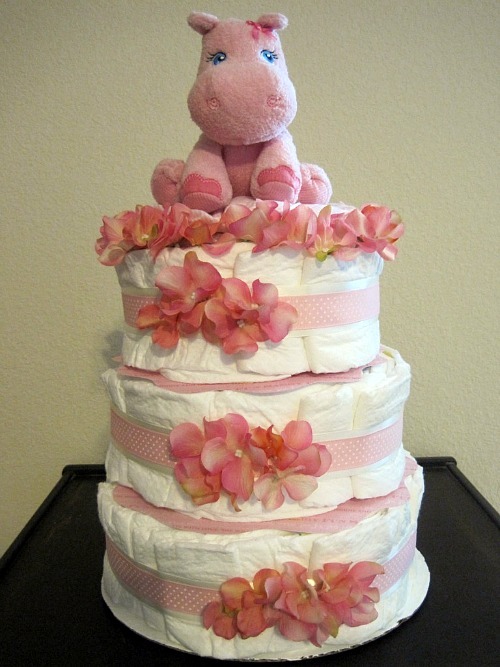 Have you ever made a diaper cake? Any other tips/tricks? I don't exactly know where to begin on this one. Let's see...your office has a decorating committee for parties? Well now, things have changed around the water cooler. The diaper cake turned out fantastic. I recently went to a shower, and they used these at each table. Great idea with the onesie. When I first looked at this I thought that you were telling us something! Phew! I get it! Totally cute idea!! I loveee the animal on top! Largely because I love fluffy items and creatures. I like how you set up the tutorial. 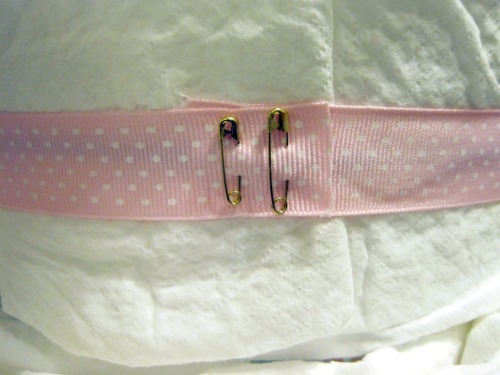 I've always wondered how those diaper thing worked. Babies are a mystery to me. lol! 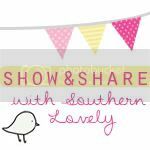 I love these clever ideas for baby showers! This is so cute! I saw one on Pinterest that was a motorcycle. haha! Yours came out so well - I bet the mama to be was thrilled with it. I've never made one of these, but I've done cupcakes filled with vests. Wow! This turned out so nice! Cutest diaper cake ever!! Looks like it was a lot of work too. I'm impressed :) Hope the shower went well! You know this is going to be featured everywhere, right? Well, one of the many places is my place! 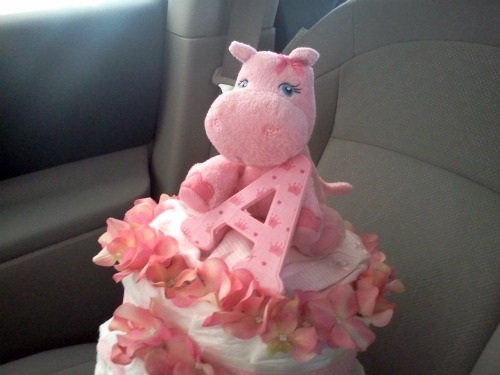 Really really cute diaper cake! I also use a tube in the middle when I make mine as well! Your hippo diaper cake is so adorable!